Drama at the FBI is nothing new. Given its 109-year history, the FBI has seen many scandals and numerous directors come and go. Its directors, in fact, have always been the face and driving force of the FBI. Most have retired or moved on to other work, four were forced to offer resignations, but only two, including most recently James Comey, have been fired outright. While FBI directors always served at the pleasure of presidents, they differed in their closeness to the chief executive. Most notably, FBI Director J. Edgar Hoover (1924-1972) worked to satisfy the political interests of some presidents and secretly undermine others. Since his death in 1972 and revelations of abuses, the federal government has treated the FBI director as independent from the White House. As a historian who has long studied the FBI and its work, I believe knowing the agency’s past is crucial to understanding the firing of FBI Director James Comey and what may come of it. When the FBI was founded in 1908 during the Progressive Era, federal law enforcement was in its infancy. The Justice Department was only 38 years old. It was established in 1870 during Reconstruction in an effort to protect the constitutional rights of African-Americans, significantly by crippling the Ku Klux Klan. As the U.S. experienced rapid and massive industrialization, a realization emerged: Only the federal government was powerful enough to reign in rampant corporate corruption and abuses. President Theodore Roosevelt established the Bureau of Investigation (“Federal” was added in 1935) by executive mandate. Chief Examiner Stanley Finch became the first leader of the bureau. The title of “director” would not be adopted until later. When the FBI was established, its purpose was to help enforce federal anti-monopoly and interstate commerce laws by scouring corporate financial records for wrongdoing, while Justice Department attorneys prosecuted. This mission was at the behest of President Roosevelt, whose interests involved regulating abusive aspects of corporate capitalism. Over time, however, the FBI and its directors assumed increased responsibilities and became more independent. But balancing this authority and independence was sometimes a struggle, resulting in scandals. Finch was obsessed with prostitution, calling it “evil” and writing widely about its threat. He avidly pursued it as head of the FBI. His efforts were based on passage in 1910 of the White Slave Traffic Act, a law banning the transportation of women across state lines for “immoral purposes.” The bureau’s investigative responsibilities quickly expanded to include targeting prostitution rings. The law’s wording, however, was vague — resulting in FBI agents enforcing their ideas about morality and the proper roles of women and men. With passage of the Motor Vehicle Theft Act in 1919, FBI agents also began to target criminals driving stolen cars across state lines, like John Dillinger in the 1930s. The investigative realities of both laws made it necessary for agents to investigate crimes in the field, rather than examining financial records from behind a desk in Washington. The FBI established field offices across the country. During World War I, the FBI’s responsibilities expanded again. This time it entered the field of domestic security. Fears of external influences abounded — immigrants, so-called “hyphenated Americans” like Italian-Americans and concerns over German espionage and sabotage. The FBI independently enforced new laws covering espionage, sedition, the draft and immigration. A. Bruce Bielaski was head of the bureau at the time. He was a former subordinate of Finch, a lawyer, son of a minister and member of the Justice Department baseball team. During his tenure, Congress investigated mass federal enforcement of the Selective Service Act. The FBI rounded up and illegally detained Americans until those who were detained could prove they had registered for the draft. Ultimately, Bielaski was forced to resign in February 1919 for his handling of the raids. FBI improprieties did not end as the U.S. entered the 1920s. Under the leadership of William J. Burns, the first FBI head to use the title “director,” the country experienced what until Watergate was the granddaddy of American political scandals: the Teapot Dome scandal. President Warren Harding’s financially strapped interior secretary, Albert Fall, had allowed oil companies to tap U.S. Navy emergency oil reserves in Teapot Dome, Wyoming, in return for kickbacks. Eventually Sen. Burton K. Wheeler and others discovered and began investigating the improprieties. 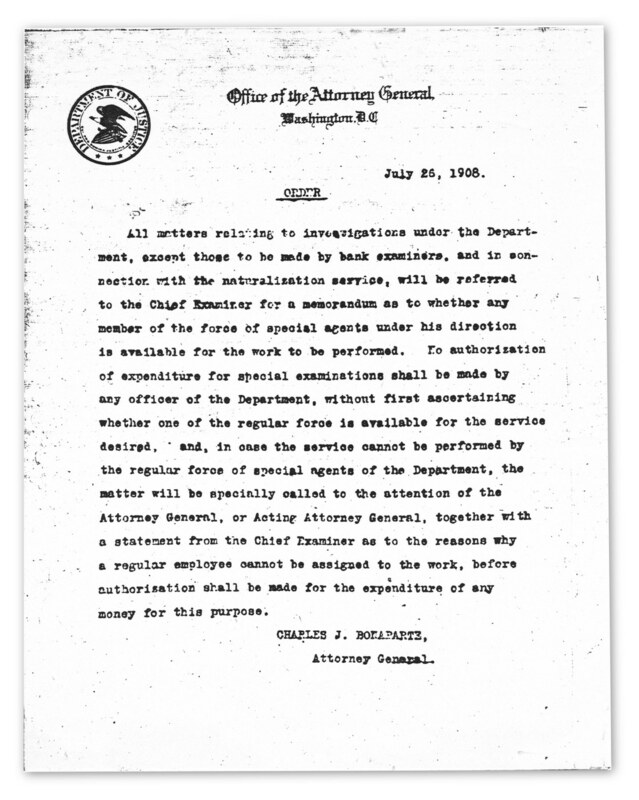 FBI Director Burns, at the request of Attorney General Harry Daugherty, tried to end the Senate probe. Burns was the owner of a private detective agency, and a man apt to believe investigative ends justified the means. He was not afraid to target powerful men. So, he dispatched agents to dig up dirt on Sen. Wheeler. Not finding any, he and Daugherty concocted baseless corruption charges against Wheeler that only backfired. The attorney general was fired and replaced with a reformer, who promptly forced the resignation of the corrupted Bureau Director Burns in 1924. The FBI was placed under the tutelage of J. Edgar Hoover. Under Hoover, the FBI evolved from a relatively small investigative agency to a large, professional and influential law enforcement and national security body. It assumed arrest powers and focused on process and scientific detection techniques to target celebrated gangsters of the 1930s. Then, under President Franklin Roosevelt, it shifted to prioritize national security and intelligence investigations. Over time, Hoover’s FBI also became notorious for its political intelligence gathering, obscenity investigations, secret files and targeting of African-Americans, gays, war protesters and leftists. When the public became aware of these activities after Hoover’s death in 1972, the FBI worked to repair its damaged reputation. Congress further mandated that directors would serve a statutory 10-year term to avoid the abuses of an entrenched Hoover, who was director for 48 years. It would also help avoid FBI directors being subservient to partisan presidential interests. Weeks before Watergate, Nixon sycophant L. Patrick Gray stepped in to replace Hoover as acting director, and was nominated by Nixon to serve as permanent director. He soon withdrew his nomination, however, and resigned as acting director in April 1973, after admitting to destroying Watergate-related files. Later came William Sessions, a former federal judge who took the job under President Ronald Reagan in 1987 and focused on white-collar crimes. Sessions, however, violated bureau procedures and federal law by using FBI resources for personal trips and home improvements. After an in-depth internal ethics investigation, he sternly resisted six months of White House demands for his resignation. President Bill Clinton personally telephoned Sessions and fired him in July 1993. This was the first outright firing of a director. This brings us to James Comey, famous for his Boy Scout’s reputation and independence streak, and now only the second FBI director to be fired outright. There are shifting accounts over why he was fired, focusing either on his handling of Hillary Clinton’s emails or the Trump-Russia investigation. Unlike the case of Sessions, where an internal probe was first concluded, the inspector general’s examination of Comey’s actions in the 2016 election have not yet ended and its status is unclear. Also unlike Sessions, where he was pressured for six months to quit, Comey’s firing was sudden and indirect – he heard about it from news reports while visiting an FBI field office — with a paper trail of recommendations about it dated only to the actual day of the firing. How this all will unfold remains unclear, but it is a dramatic moment in a long history of FBI directors and their exits fitted to their times.